Optimum 20-bit Hi-D transfers from the original first generation 1972 1/2" Dolby A master tapes. Includes a fascinating outtake of Winter, plus the first release of a previously unavailable 1986 companion work, Land of the Midnight Sun. When Sonic Seasonings was composed, there was no existing category for music of its kind: "a third, viable alternative to acoustic and musical environmental presentations." What became a catch-all of laid back, ephemeral styles, "New Age Music," was yet to come-over a decade in the future. We thought of it simply as another promising new way to make electronic music. We wanted to combine instrumental and other performed layers, with those taken directly from nature, and thus unperformed. Since the term "Sound Design" was a concept that didn't yet exist by name, we had to innovate, working over and designing aural qualities and effects, building raw timbres from the ground up. Today no one would blink. Back then it was unproven and pioneering. It was Rachel's and my goal to find a way to assemble music that had a much longer span and overall arch than most contemporary music of the time. We also wanted it to avoid the label of Classical music; these were not intended to be mini-symphonies, except in the subtlest and most analytic way. They were not intended as Popular music, either, as the extreme length of each movement will prove. They were also not Jazz, although some improvisational elements form an integral and essential part-while other elements are strictly composed and notated before recording them. The music was deliberately minimal-this before the category of Minimalistic Music had been developed and in vogue. It was intended to work on a timbral and experiential level, so the sound could "flow over you," not a cerebral exercise like so much of what is now seen to be a wasteland of serious music from mid 20th Century until recently. There is a long-overdue demand for a definitive two track stereo re-release of Sonic Seasonings. New developments will make it possible to do a real multichannel stereo surround version soon as well (note: multichannel DVD-Audio has just been standardized -- yeay!). That will be personally very satisfying to me. After all, back in 1971 I had requested that CBS release the album using the then new CD-4 true Quadraphonic system. CBS refused (after all, JVC along with "the enemy", RCA, had developed CD-4! ), wishing to use their imitation, pseudo-quad compromise, SQ. A standoff. Another big surprise after all these years is that two track stereo is still the standard, most popular method of music reproduction found in the world, a status not about to be replaced anytime soon. This deluxe edition therefore will satisfy that genuine need. We have used every possible care to assure the integrity of this digital master to the original mixed tapes. The actual 3-M tape machine used to record those first generation surround masters was painstakingly refurbished and brought up to spec. Other than Dolby, no auxiliary equipment was placed in the circuit path into our high resolution A/D convertors. The 4 to 2 channel "fold-in" reduction was fed directly to the DAW, replicating the process I'd developed originally for our CBS two track masters, including that "nearly surround" property. I hope you enjoy hearing all the details, clarity and sonic depth that remained inaudible up until now. Sonic Seasonings has the form of a musical suite, made of four contrasting movements. Each is loosely based on images of the four basic seasons on our planet: Spring, Summer, Fall, and Winter. In that way they are descendants to an extent of what is called: "programmatic music," music that sets a mood and can even suggest events and scenes. There is no real plot in any of the movements. Instead they suggest a cyclic point of view that moves onto a few other musical locations, and eventually returns to a similar setting as whence it began. This is sometimes called Arch Form, just as the name suggests, going up and over and then down and back again. While we were aware of these formal niceties while composing the movements, they were just intended to be a mild guide, to help keep the overall shape intact, as it difficult to retain consistency and coherency over musical sections lasting around 22 minutes apiece. One of the most fascinating-and least explored-areas of scientific investigation is that of psychoacoustics, the manner in which the ear and brain interact to sounds. In reality, any sound that we hear is subject to interpretation by our individual experience and the circumstances surrounding that sound. For example, a loud sound will register on the ear as either louder or softer, depending on the sound that precedes and follows it. Similarly, a quiet tone gains in intensity by the degree of loudness surrounding it. When these qualities of sound, or music, are deliberately "mixed" or manipulated, the result can be a fascinating perceptual "illusion" that enriches today's musical palette almost beyond imagination. All this is simply to explain what Sonic Seasonings is all about: It is an aural tapestry, created by the imagination and expertise of Wendy Carlos, from impressionistic and expressionistic experiences of Nature. It contains natural sounds, recorded in Quad as realistically as possible and subtly mixed with electronic and instrumental sounds in an effort to create four evolving, undulating cycles evocative of the moods of earth's seasons. We have manipulated these sounds--electronically orchestrated them, so to speak--into an amalgam of the natural and the synthetic. The sounds and music in this album represent, then, a painstaking synchronization, re-ordering, and blending of as many as 48 Dolbyized tracks at a time (note: this was a lotta tracks in 1971! ), and, we hope, suggest a third, viable alternative to acoustic and musical environmental presentations. But on the level of pure enjoyment, these records were designed to be a part of the decor, so to speak-a sonic ambience that enhances the listener's total environment. On still another level, Sonic Seasonings takes listeners out of their environment and into the countryside of their fantasy: The weary urbanite can eavesdrop on the conversation of chattering birds; the mountain dweller can lave his soul with the sound of the surf, and so on. We ask, however, that you, the listener, supply one element that we could not possibly blend into the final mix-your own imagination and his remembrance of Nature's blessings. Land of the Midnight Sun, never before released, is included here since it matches the style, mood, and pacing of Sonic Seasonings to a remarkable degree. It began as an experiment I undertook during the late Summer of 1986. We had just gotten our second digital stereo recorder, and I wondered if their extremely low noise would allow a return to the sound-on-sound techniques pioneered by Les Paul in the 50's. How many generations of added parts might now be possible? The surprising answer was "over a dozen," well beyond the maximum with even the finest analog recorders! Sound-on-sound is a brutally unforgiving medium. If you make a mistake, you must rewind, take a deep breath, and begin that take again from the top. When I made LMS there was also no practical way to edit our digital tapes. This double-challenge encouraged working more like a jazz ensemble: each part was improvised over the underlying chord changes. Everything here is played "live" in real time on my Synergies. This includes all the repeating patterns, which I was able to perform into the Synergies as uneditable sequences, and could later trigger in any key. I also used an optimized version of Werkmeister's Circular tunings, which results in much smoother harmonies than from the usual tempered scale. Original LP: Original package design: Rachel Elkind-Tourre & Ed Lee. With thanks to: R. Dennis Schwartz, Stephen Temmer, Phillip Ramey, Chris Nelson, Sue C. Clarke, Bebe Schwartz. First released 1972 as Columbia PG 31234. Special Thanks, Remastered CD: John Romkey, Chris & Todd & Georges @ Arboretum Systems, Eric Klein @ Waves, Joe Winograd @ Aris, Matthew Davidson @ MotU, John Klett, and Clare Cooper. Graphic remix by Drew Miller @ SmartSet. 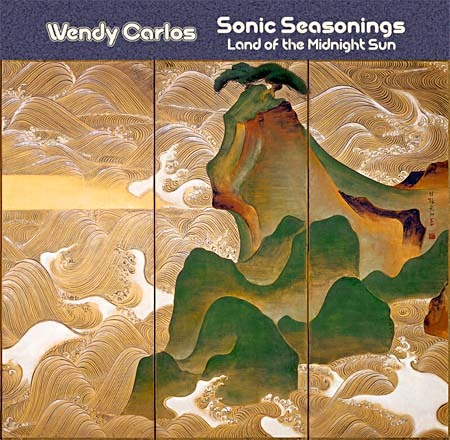 Before there was something called New Age music and ambient recordings,and before there were nature CDs or relaxation music, CBS released a 2-LP set by Wendy Carlos called SONIC SEASONINGS. Beautifully packaged in a gatefold sleeve featuring a lovely Japanese print, many remember the graphic as much as the music itself. And that music was unlike anything heard before: electronic synthesizers and nature sounds recorded "in the field" so perfectly meshed that it was hard to distinguish what was which. Now, over 25 years since its original release, comes the first CD release of this extraordinary work, with details and sonic depth not attainable until now, painstakingly remastered by Wendy herself using "Hi-D 20-bit" technology. This is a landmark recording of the New Age, Ambient, and Nature / Relaxation genres, created long before those genres had names. As a bonus, this 2CD set contains an alternate ending to "Winter," and a major work from 1986, previously unreleased. "Land of the Midnight Sun" depicts breathtaking polar light displays over a crystalline, frozen tundra, full of beauty and danger. Back in the early eighties, there was a revival of ambient nature recordings designed to get your mind out of the office and back to your origins as a species-- the downtown escape to the wilderness. Enlightened bookstores and coffee galleries boasted a series titled "Elements," which was about 20 or so different full- length recordings of different ambient nature scenes, from rain falling to crickets at night to the seashore. It was the high- tech way to release the primordial need. About the same time, new synthesizers and sound technology made possible a whole new approach to spiritual music, in the form of "new age." This ultra- modern approach to soul definition led to the rise of labels such as Narada and American Gramophone, and to the dismay of many, the rise to fame of new age superstar Yanni. Through the nature synthetic and the science- fact techno- compositions, people were finding routes of ambient aural escape to free themselves from Reagan-era monotony. But long before then, in 1972, an absolutely brilliant merging of these two styles had already occurred. Wendy Carlos, already tenured from her role in the Switched-On Bach record and the soundtrack to "A Clockwork Orange," successfully creates the audio equivalent of the Reese's Peanut Butter Cup-- combining two great recording genres and making them great together. The theme for Sonic Seasonings is an audio representation of the four weather phases of the Earth's rotation. A simple enough idea, and something that had been done plenty of times before-- probably most notably by Vivaldi. Wendy Carlos, however, has to draw upon her intimate knowledge of the Moog keyboard, and also the ability to include select ambient sounds that she feels assist in representing what each of the seasons sounds like. The result is mystical, deeper than the most ambient of ambient, enchanting, hypnotizing, and frighteningly accurate. The senses that Carlos is able to awaken with early 1970s technology is certainly comparable to the most layered of modern "black-box" compositions. It's hard to imagine that after eighty minutes, a whole year has passed by, but the soothing nature of Carlos' structures lulls one past time, unlike many of the "scratchy" keyboard recordings of roughly the same era. Talk about the ultimate in mood music. This two-cd release captures the essence of the four seasons (Spring, Summer, Fall and Winter) in all their glory. On top of that I got to experience the sensation of the Aurora Borealis and felt like I was floating through space with the tune Midnight Sun. Wendy has a way of giving feelings a voice with this synthesized work of art. With the first cut Spring all the senses come alive just through her use of sound. You get the feeling of walking on the sweet grass, the birth of nature and the emotions of it all. Before there was ambient music, in a time before the New Age, there was Wendy Carlos's Sonic Seasonings, a double LP released in 1972. Taking the form of Antonio Vivaldi's The Four Seasons, Carlos orchestrated four side-long soundscapes designed, according to producer Rachel Elkind, to be "part of the decor." Using only her Moog synthesizer and environmental sounds, Carlos created prototypical ambient music, predating Brian Eno's similar work by a few years. Carlos weaves gentle, often reedy synthesizer melodies through chirping birds on "Spring," phase-shifted church organ drones across crystalline bells and wind on "Winter," and she seems to simulate an alien space landing on "Summer," mimicking nature with her synthesizer. An added treat on this special double CD is a 40-minute, unreleased, two-part suite from 1986 called "Land of the Midnight Sun." Using her Synergy synthesizers, Carlos orchestrates slow-motion melodies and overlapping minimalist layers that recall Steve Roach's "Structures from Silence." Sonic Seasonings is the first wave of a batch of Wendy Carlos reissues. While many of Carlos's classical, "Switched-On" orchestrations have an antique, dated charm, this original composition sounds fresh and current. In attempting a music that wouldn't draw attention to itself, Carlos achieved a prescient work of subtlety and depth on Sonic Seasonings. Wendy Carlos - "Tales of Heaven & Hell"
Finally!!! Sonic Seasonings has been at the top of my list of CD-wants since 1984. The depth of field, stereo imaging and quietness of some passages just cry out for the digital treatment. It was revolutionary when released in 1972, and you know what? It's still revolutionary today. It's not classical, not jazz, not popular -- today this album would be filed under "New Age" but that term was unknown 26 years ago. Carlos takes natural recordings and mixes in wisps of melody and synthesized birds, insects and wind, creating sonic tapestries more real than real. As a listening experience it never ceases to astound, and over thousands of playings I have yet to get tired of it. For the CD re-issue she has dug out an alternate ending to one of the tracks, which is fascinating seeing other directions she considered. She also drops in, unannounced, a whole unreleased album(!) from 1986, two 20-minute tracks done in a similar style but utilizing the digital technology available 14 years later. My old LP is shiny from being played to death. I'm glad to finally be able to retire it. Wendy Carlos - "Sonic Seasonings +"
= Excellent work!! Put on your best headphones; find a comfortable spot; and bliss out!! You will actually need a warm coat to get through the "Winter" offering.This is a wonderful example of early "zone-out" music, and you will not be disappointed if your goal is total immersion in "nature," thanks to the genius of Wendy Carlos. Enjoy. = After 26 years of waiting, it's finally available. Following the success of S-OB, Wendy continued to bring out amazing music. Using available technology but always making the technology serve the music she created magical sonic places. Turn the lights down, listen to Winter and feel the chills down your spine as you hear the Arctic wolves. We've had the vinyl since 1972 and take it out reverentially once a year. Can't wait to receive CDs. This will be the best Christmas gift we'll give each other. = Excellent - 15 years ahead of its time R Carlsberg's review of the original record is accurate (i.e. it mirrors my opinion).